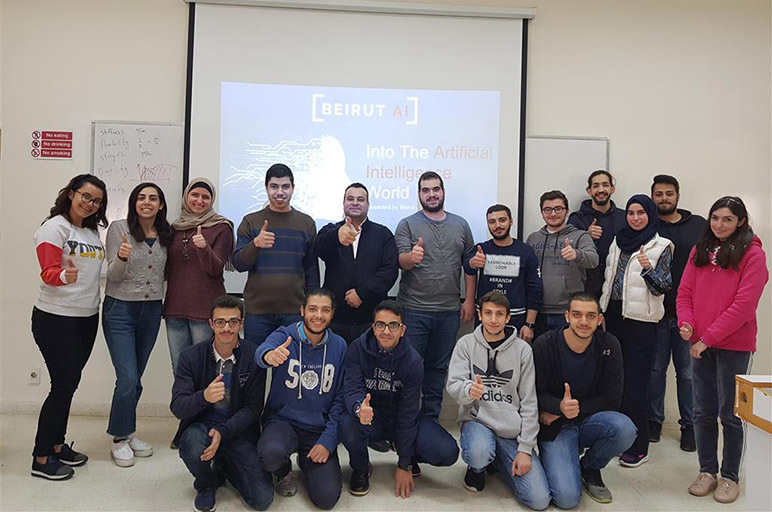 The Computer and Information Systems Department and the RHU ACM Student Chapter, in the College of Sciences and Information Systems, organized a hands-on workshop on Artificial Intelligence - Data Science on Friday April 5, 2019 from 2:00 to 6:00 p.m. The workshop was given by Ms. Alaa Maarouf, Ms. Larissa Abi Nakhle, and Mr. Obeida El Jundi from Beirut AI. The students explored a graduate admissions dataset by walking through a typical data science project, starting with reading and importing data, to exploratory data analysis, and wrapping it up with machine learning predictions. Speaking abou the importance and purpose of the workshop, Dr. Mohamad Ladan, Professor of Computer Science and Dean of the College of Sciences and Information Systems, stated that “Data Science is the most widely used technique among Artificial Intelligence, Machine Learning, and Data Mining. The college encourages those workshops to help spread awareness among students of the latest technologies and trends in different majors and careers, in general, and in the area of Artificial Intelligence and Data Mining in particular, since it is one of the four areas of concentration in the Computer Science program at RHU”. He concluded by thanking everyone involved in organizing the workshop from students, instructors in general, and the CIS department and the Computer Science Society/RHU-CIS ACM Student Chapter in particular.